Tmt. 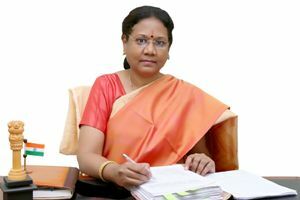 Santha IAS Collector and District Magistrate is an officer of the Indian Administrative Service belonging to 2005 batch. She did upto her post graduation in English Literature from V.V.Vanniaperumal College for Women, Virudhunagar. Later she completed M.Phil and MBA(Marketing) in Madurai Kamaraj University. The Public service always allured her, right from her childhood. It is her passion to contribute in rural economic activities, education, livelihood, infrastructure, environment, self sufficiency, children’s rights and also empowerment of women through skill training & employment. She is committed to prevent child marriages and also strive hard for girls continuing education. She was first selected through TNPSC-Group I as Deputy Collector in 1997 and she has vast and varied field experience as RDO in two divisions i.e Gudalur, in the Nilgiris district and Gobichettipalayam, Erode district. Served as Senior Regional Manager in Civil Supplies Corporation – Chennai(North), District Revenue Officer – Erode District, Deputy commissioner- Coimbatore City Municipal corporation, Deputy Secretary in Rural Development and Panchayat Raj department, Joint Commissioner – Commercial Taxes, Commissioner- Disciplinary Proceedings – Coimbatore, Managing Director- Sago Serve, Director – Sericulture, Managing Director-Corporation of Women Development, Chennai and now serving as District Collector, Perambalur.